How to Identify 60 Bird Feathers in North America #infographic ~ Visualistan '+g+"
Have you ever seen an amazing feather design, whether it was on something decorative, or on someone's tattoo, and wondered where the idea came from? There are so many incredible birds that can be found across the skies of North America, and while they may not be as unique as tropical birds, they're still interesting to study and take photos of! Easily, the Golden Eagle has the large feather on this infographic, followed closely by the Bald Eagle's feather. Meanwhile, you have birds like the Lazuli Bunting, Green Kingfisher, and the Grasshopper Sparrow which all have incredibly small feathers that pale in comparison to the two types of Eagles. This infographic will help you identify all different types of tail feathers that you might encounter across North America. 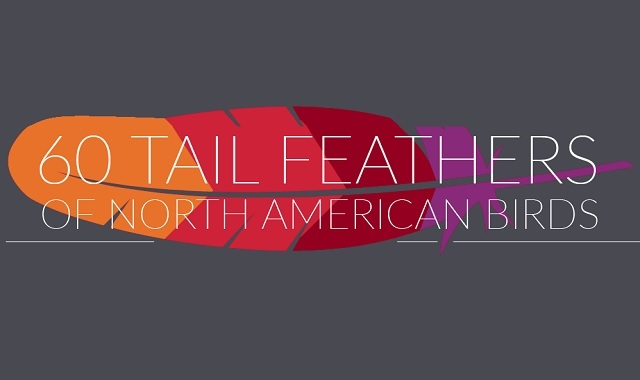 Which is your favorite from these 60 tail feathers of these birds that call North America home?